Not even Mike Zimmer could anticipate how well the Vikings’ prized defensive line would play in the season-opening victory. Not even Mike Zimmer could anticipate how well the Vikings’ prized defensive line would play in its debut with Sheldon Richardson in Sunday’s 24-16 win against the 49ers. While San Francisco saw two offensive linemen leave the game to injury, the Vikings’ front four dominated from start to finish regardless of who was in the game. In all, the Vikings’ defensive line of Richardson, Linval Joseph, Everson Griffen and Danielle Hunter combined for 8 of the 9 hits on Jimmy Garoppolo and 7 of the Vikings’ 9 run stops (gains of 2 yards or less). Richardson was the star of the group Sunday, tallying three run stops, three QB hits, a 0.5 sack and a drawn hold. He capped his day by hitting Garoppolo during the game-sealing interception to safety Harrison Smith. 1. Pressure report — Hunter (58 snaps) was simply too much for 49ers rookie tackle Mike McGlinchey, and later Garry Gilliam when injuries forced McGlinchey to move to guard. Hunter had eight pressures, including a sack in which he thoroughly beat Gilliam with a speed rush in 3.1 seconds. Griffen (51 snaps) added four pressures, including a hit and split sack with Richardson (46 snaps). Joseph (49 snaps) flashed his usual strength against the run, even adding a hit to start the third quarter when he benched center Weston Richburg into Garoppolo’s lap. Zimmer turned up the heat in the fourth quarter, calling three straight blitzes that netted Anthony Barr’s pass deflection, Smith’s sack and an incompletion to start the following drive. On offense, quarterback Kirk Cousins saw a mixed bag of clean pockets and not-so-ideal situations. 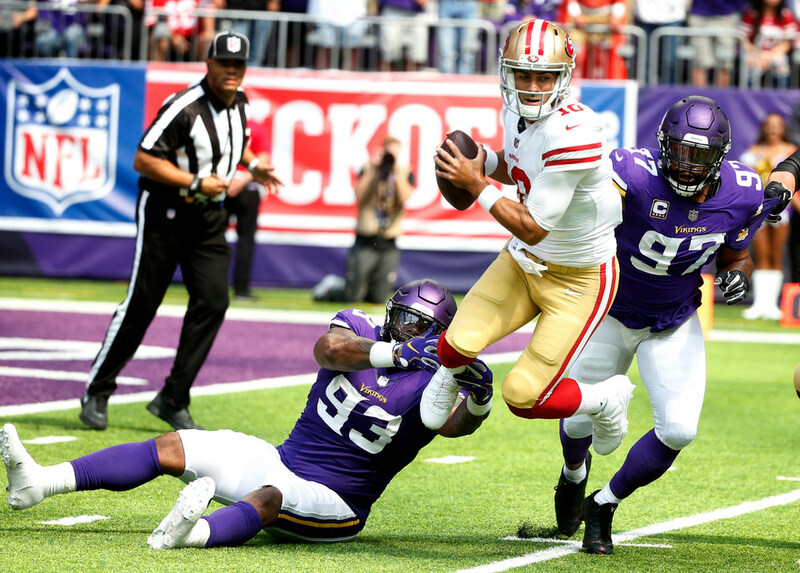 DeForest Buckner’s three sacks were the product of three very different plays: first, Buckner simply beat left guard Tom Compton on a rush; secondly, Buckner benefited from a poor blitz pickup by right tackle Rashod Hill, which led to Cousins fleeing into him; thirdly, Hill and right guard Mike Remmers struggled to pick up a twist that led to Cousins again running into Buckner. The Vikings offensive line — a group that didn’t play a single snap together in the preseason with center Brett Jones — had miscommunications. They particularly struggled against the 49ers’ defensive line twists, resulting in a few pressures. Arik Armstead beat left tackle Riley Reiff inside on a twist to ruin any chance of converting an early 3rd-and-14 attempt. Reiff otherwise played a clean game. 2. Misdirection and Mike Hughes — Upon second look, rookie corner Mike Hughes’ NFL debut was a lot more up and down than it seemed after he came away with a pick-six and was credited with three pass deflections. His role expanded after Trae Waynes (24 snaps) exited the game with a right knee injury. Hughes stepped in at left cornerback and had a hand in some of the Vikings’ coverage busts, including the 56-yard catch and run by Kyle Juszczyk and 13-yard toss to tight end George Kittle. Hughes simply got lost. “A couple plays that they hit on us were things that he just blanked out on,” Zimmer said. On Juszczyk’s 56 yarder, Hughes carried his receiver’s route too far inside where the safety was there to pick it up in their pattern-matching scheme; he left the sideline wide open for Juszczyk’s huge play. Of course, the Vikings’ secondary was still there to pounce whenever a mistake was made, including a route miscommunication on Hughes’ pick-six, an overthrown ball on Xavier Rhodes’ interception and a desperate decision under pressure when Smith picked off Garoppolo at the end. 3. Anatomy of a play — Each week, I’ll break down a standout play that doesn’t necessarily mean game-changing. This 5-yard run by Dalvin Cook is an example of the play design creating more intrigue than the result. The Vikings installed run-pass options into this year’s offense with coordinator John DeFilippo bringing his influences from the Eagles. No play from Sunday jumped out as an Eagles blueprint more than this one. Philadelphia used this split blocking scheme in its Super Bowl win over the Patriots in February. What makes this particular run-pass option different is the blocking scheme. The left side — guard Tom Compton and tackle Riley Reiff — pass block while the rest of the line tries to sell an outside zone run. Defenders read the offensive line, so the 49ers linebacker and safety over the left side stay flat footed awaiting a pass, while other defenders flow toward the run blocking. The scheme created space in the middle, where Cook gains a couple yards before he’s touched on the 5-yard run. 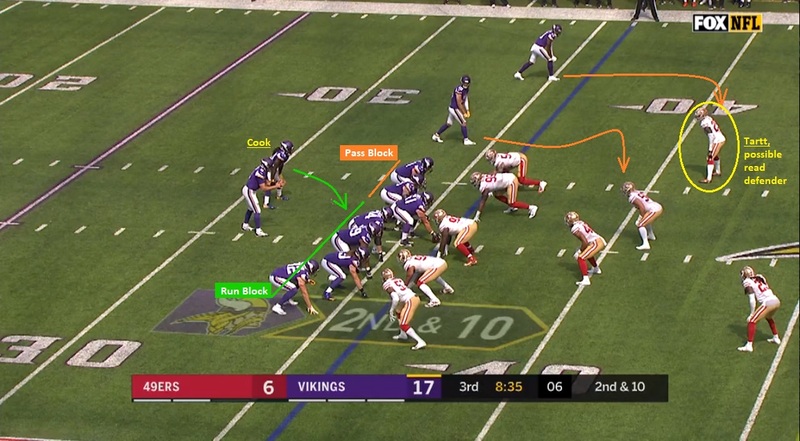 Should 49ers safety Jaquiski Tartt (circled) or the playside linebacker crash toward the run, Cousins has an open throwing lane to receiver Adam Thielen out of the slot. Cousins made the right read, letting Cook pick up an easy five yards. 4. Cook impressive, even if blocking wasn’t — Running back Dalvin Cook’s workload (22 touches via 57 of 71 snaps) left no doubt about his recovery nearly a year removed from the torn ACL in his left knee. Cook cut and shook defenders with relative ease on the knee, breaking five tackles while picking up 90 total yards. Cook’s most impressive run ended with the fumble. He broke through two tackle attempts, while four 49ers defenders got a hand on him, up the middle for a 15-yard gain. The issue for Cook, who gained 40 yards on 16 carries, was the little room he had to work with behind a patchwork offensive line. But really, the run blocking issues stretched beyond two fill-in starters in left guard Tom Compton and center Brett Jones. San Francisco’s defensive backs were aggressive against the run, leaning in to form 8-man fronts on Cook’s first two runs that totaled three yards. Each time, a Vikings tight end — Rudolph and Morgan — were beat by tough assignments in Arik Armstead and Solomon Thomas. An overarching issue was the interior line’s inability to reach linebackers, which is partly why 49ers linebacker Fred Warner led all defenders with 12 combined tackles on Sunday. 5. Cousins’ highs and lows — Cousins will enter Sunday’s game in Green Bay still searching for his first fourth-quarter completion in a Vikings uniform. He went 0-for-6 (not counting a final throwaway to kill time) as the offense failed to provide more breathing room from San Francisco’s comeback attempt. The lows started with his late pass to Diggs, the dropped interception by Tartt. Cousins also threw behind a covered Thielen on an ensuing third-and-11; had an underthrown pass to Thielen on a deep ball; then he sailed a pass in the face of a blitz over Diggs’ head on third-and-9 while Thielen was open on the same side of the field. Thanks, in part, to a suffocating defensive effort by the Vikings, Cousins’ highs outweighed the lows in his debut. The three most impressive passes were the two touchdowns — a 22-yard strike to Diggs dropped just over Ahkello Witherspoon’s shoulder and the 11-yard touchdown to a covered Rudolph similarly placed over Tartt’s shoulder pad. Cousins did well throwing on the run, which could come in handy this season. While fleeing right, Cousins side-armed a pass to tight end David Morgan for a 9-yard gain on third down. Cousins was particularly effective off play-action passes, completing 6 of 8 throws for 70 yards. One early pass was setup well by DeFilippo, who called three straight Cook runs with the back aligned in the ‘dot’ formation — which is the standard seven yards behind Cousins. On the fourth ‘dot’ alignment for Cook, Cousins pulled the ball back and found a wide-open Diggs for 18 yards as the receiver worked Richard Sherman in man-to-man coverage.